Part 1 Fruit, vegetables and health: Health benefits of increased fruit and vegetable consumption; Antioxidants in fruits, berries and vegetables; Improving the nutritional quality of processed fruits and vegetables: The case of tomatoes. Part 2 Managing safety and quality in the supply chain: Modelling fruit and vegetable production: The case of tomatoes; HACCP systems for fruit and vegetable cultivation; Maintaining the post-harvest quality of fresh fruits and vegetables; Measuring fresh fruit and vegetable quality: Advanced optical method; Applying advanced instrumental methods: Mealiness in fruit; Maximising the quality of thermally processed fruits and vegetables; Safety of cooked chilled foods containing vegetables. Part 3 New technologies to maximise quality: Measuring and improving the natural resistance of fruit; Improving the shelf-life of vegetables by genetic modification; Minimal processing of fresh fruits and vegetables; New modified atmosphere packaging (MAP) techniques for fresh prepared fruit and vegetables; Edible coatings for fruits; High pressure processing of fruit and vegetables; Use of vacuum technology to improve processed fruit and vegetables. Fruit and vegetables are both major food products in their own right and key ingredients in many processed foods. There has been growing research on their importance to health and techniques to preserve the nutritional and sensory qualities desired by consumers. This major collection summarises some of the key themes in this recent research. Part one looks at fruit, vegetables and health. There are chapters on the health benefits of increased fruit and vegetable consumption, antioxidants and improving the nutritional quality of processed fruits. Part two considers ways of managing safety and quality through the supply chain. A number of chapters discuss the production of fresh fruit and vegetables, looking at modelling, the use of HACCP systems and ways of maintaining postharvest quality. There are also two chapters on instrumentation for measuring quality. Two final chapters look at maintaining the safety and quality of processed fruit and vegetables. Part three reviews technologies to improve fruit and vegetable products. Two chapters consider how to extend the shelf-life of fruits and vegetables during cultivation. The following three chapters then consider how postharvest handling can improve quality, covering minimal processing, new modified atmosphere packaging techniques and the use of edible coatings. 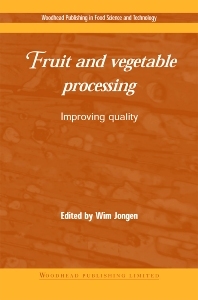 Two final chapters discuss two major recent technologies in processing fruit and vegetables: high pressure processing and the use of vacuum technology. With its distinguished editor and international team of contributors, Fruit and vegetable processing provides an authoritative review of key research on measuring and improving the quality of both fresh and processed fruits and vegetables.